Took this pic of the ETV 'Anglican Princess' on station off Penzance, in Cornwall a few weeks ago. Note the MCA logo. She is on call all year for any emergency that may arise with shipping. The Maritime and Coastguard Agency (MCA) awarded Klyne Tugs of Lowestoft the eight-year contract for provision of Emergency Towing Vessels (ETV) to protect the British coastline. If the Irish Government ever get serious about providing an ETV facility, the first question will be whether to follow the UK example and hire privately-owned and -operated tugs for the job, or the example of other countries in Europe and elsewhere - detailed in earlier posts - and combine the ETV capability with other Coastguard/Naval jobs in a multi-purpose vessel. The latter would seem to be a more efficient solution for a smaller country. Last edited by thebig C; 22nd October 2007 at 11:36. The Anglican Monarch is the ETV that visit's my area often. Hi PMTTS, hope you don't mind, I cleaned up your photo a bit as it was such a good shot with the tug pushing water, I couldn't resist. Nice part of the world the New Forrest! Just a minor bit of nitpicking: isn't it 'Anglian' rather than 'Anglican'? I do have my own pic of an ETV towing a cruise ship in Southampton last year, but cant find it!. I would agree that the latter would be more efficient. Have also attached a grounding / salvage op that a Klyne tug was involved in......however on the wrong side of the fence! It was the vessel that went aground.... because of a drunk skipper. This is exactly the reason why it shouldn't go to contract! 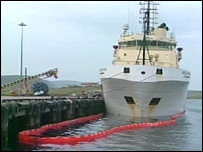 Report on the investigation of the grounding of UK registered emergency towing vessel Anglian Sovereign near the island of Oxna, in the Shetland Islands on 3 September 2005. Report no 16/2006. Published 30 June 2006. Last edited by Dogwatch; 22nd October 2007 at 22:43. Quite right! I must have been missing from school the day they were teaching spelling. Thank God for 'spell check'! Meh. Used this thread to ask a question. I caught the last bit of a news brief that a ship off tramore has lost a couple of containers over the side carrying toxic chemicals? Hundreds of containers are washed overboard every year. Shouldnt be a problem as the hazardous stuff is usually well sealed up. The vessel that lost the containers, currently entering Cork Hbr (at approx 2200 hrs on 12 Jan). The Green Party stance on ETV, when they weren't in government! Speaking in the Dáil today, Green Party Marine spokesperson Eamon Ryan TD, questioned the Government?s continuing refusal to invest in an ocean going emergency towing vessel despite the recommendations to obtain one in an independent report 5 years ago; a lack highlighted by the difficulty in rescuing the Canadian submarine which is currently drifting off the Irish coast. The Green Party also plans to raise further questions on this topic with the newly appointed Minister of the Marine, Noel Dempsey. Raising the matter under Standing Order 31, Deputy Ryan commended the bravery of the crews of LÉ Róisín, LÉ Aoife and the LÉ Niamh, all involved in bids to rescue the stricken Canadian submarine, the HMCS Chicoutimi. ?It is a testament to the courage and skill of our navy,? said Deputy Ryan. ?However, the rescue operation does raise serious questions about our Government's refusal to invest in an ocean going emergency tug vessel, recommended in an independent report five years ago ? 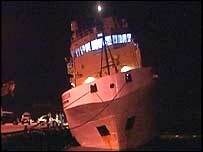 which is why the Canadian submariners will have to wait 14 hours for a British towing vessel to reach the scene.? ?The Green Party has repeatedly raised concerns with both the Taoiseach and the Minister for the Marine about their decision not to invest in an ocean going emergency towing vessel. Hopefully, the events of the last two days will lead to the Government reversing its decision. At the very least, we need a full investigation into how prepared, or otherwise, we were for the unfolding events,? concluded Deputy Ryan. The LE Niamh navy vessel is en route to the location off the coast of Co Waterford where seven containers went overboard from a cargo vessel yesterday afternoon. At least one of the containers is believed to contain a hazardous chemical Sodium Bromate. The navy is working with the Coastguard service and the Environmental Protection Agency and a decision may be made later this morning to shoot and sink any of the containers if they are found floating. The area in question is 20 miles south of Tramore. The reason for this course of action is that it would be safer to sink the containers rather than allow them to be hazards for fishing boats and to stop them coming ashore. The LE Niamh naval vessel has retrieved a number of bags of bird seed from the water in its search for a number of containers which went overboard from a cargo vessel yesterday. So far there have been no sightings of the seven 40-foot containers, which fell into the sea off the south coast about 20 miles off Tramore. It is now believed that all containers sank. The containers were carrying bird food, fire logs, medical equipment and one contained the hazardous material Sodium Bromate. The Coast Guard helicopter is due to search again this afternoon and the LE Niamh remains in the vicinity. Naval officers on board the LE Niamh say the missing containers are undectable by radar. Members of the public are being urged to stay at least 100 metres away from the containers, should they happen to come ashore over the next few days. If you want to age rapidly, try this. This was taken yesterday in the same weather that the container ship lost her containers. Have a look at the bit about three minutes in to the video. Phew! What the Swedish CG recently got from DAMEN in Holland. Should the NS get one? All three Damen MPV 8116 vessels are of the multifunctional patrol and emergency response type. Considerable research went into the operational requirements for the vessels that are intended to reduce the risk of major marine pollution on the Baltic coastline of Sweden and the narrow but busy waters separating Sweden and Denmark. The primary role of the ships is to patrol the territorial waters of Sweden, engaged in general Coast Guard duties such as fishery, environmental and marine traffic control as well as to conduct search and rescue operations, including diving and the operation of ROVs. For emergency response duties in the harsh and relatively cold conditions of the Baltic, the vessels are equipped for emergency towing (110 tons bollard pull and strong enough to hold a 150.000 dwt tanker on station in a severe gale), salvage, fire fighting (Fi-Fi 1 notation), oil spill recovery and lightering operations. To support the above functionality the vessels are equipped with advanced and integrated automation, alarm and monitoring systems. The vessels have a diesel electric propulsion system with 6 diesel generators for power generation, providing flexibility, redundancy and reliability. Furthermore, the vessels are fitted with a double hull and bottom and are fully capable of navigating in ice (ice class 1A*). The area of operation stretches to above the polar circle (GMDSS Area A4). Dynamic position systems further enhance their station keeping capabilities (maintain constant position and heading under Force 7 conditions). In order to minimize the environmental impact, the vessels are optimized for low fuel consumption in combination with extensive energy recovery from waste heat. The exhaust gas systems are equipped with special urea reactors to reduce NOx emissions. All above qualities make these unique and highly sophisticated ships and technology leaders in a class of their own. 'KBV 002' is scheduled for delivery in December 2009, with the third and even more complex “KBV 003” to follow in May 2010. Its something I've said for years - run it as an RFA type vessel - semistate. Two vessels, capable of ETV, SOPEP and barge towage. Operate on commercial lease when possible for survey and other tasks - make it DP to assist Irish lights when needed for buoy tender etc. Its a no brainer, but it will require an Exon Valdez in Dublin bay for the Government to do anything - and this is the case with all parties, not just FF and the Greens. There is plenty of work for such a vessel, and they would be fine for inshore patrolling too. However our government are inward looking(that is when they aren't completely blindfolded). At the top end of what is available you have the Canadian Kingston class, with provision could be adapted to Irish needs by beefing up the framing/ engines for towage. Essentially a mine countermeasures vessel that at the end of the cold war got re-vamped to cover other tasks. Compliment is a bit large, vessel like this could manage very well with 3/4 deck officers, 2/3 engineers, 5 deck rates, 2 ER rates and 2 catering - thats 16 leaving space for technicians, specialists, Naval Reserve trainees, divers, salvage experts etc. Don't the Canadian Naval Reserve operate those vessels? By that I assume you mean "Very Cramped".